Do you feel like cooking something new and interesting? 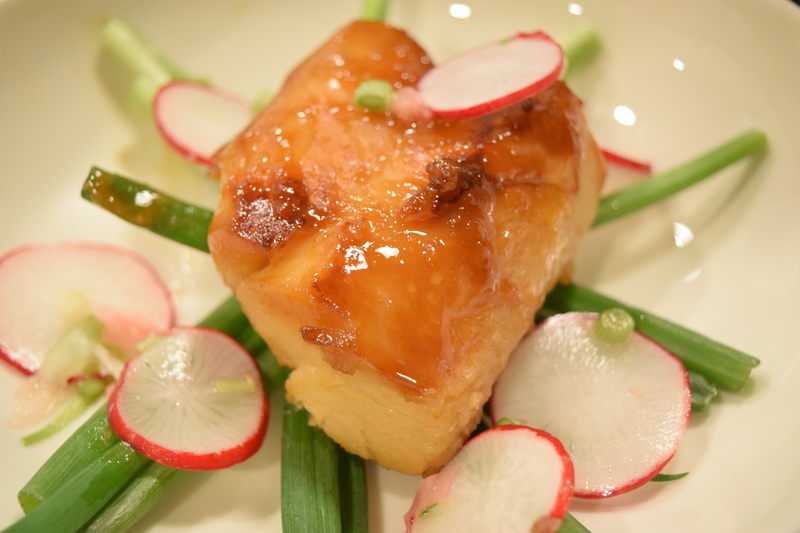 Then try this fantastic Black Cod! It’s light, tasty and different. The Asian flavors are terrific and it’s pretty easy too. I found some great, fresh-caught, Icelandic Cod at Wholey’s Fish Market that worked perfectly. Don’t try this without the pickled radish. The marinade for the fish is sweet, salty and RICH. 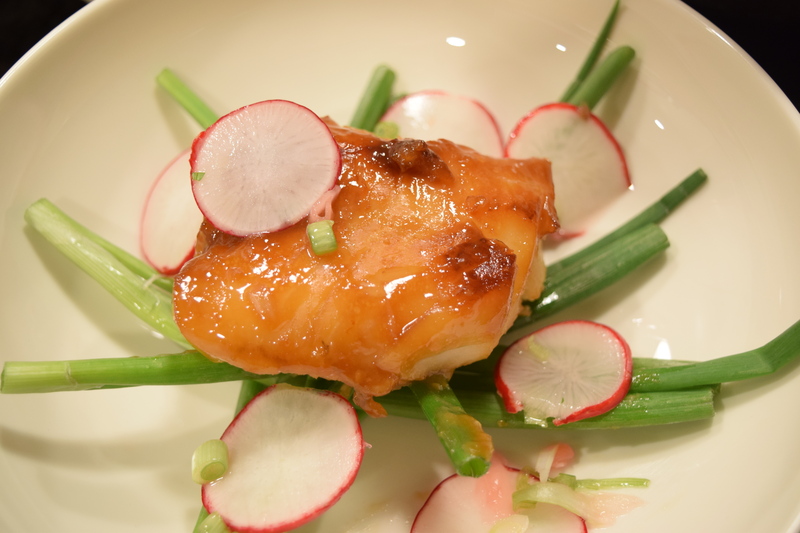 The fish really needs the contrast of the tart radish pickle! Enjoy! Tip: White Miso Paste can be found in the refrigerated section of the grocery store. Don’t look in the Asian food section. Been there, done that;-) Whole Foods carries an organic brand that was great in this recipe. In a small saucepan, mix the honey and miso with a splash of water. Boil and simmer until dark golden, stirring regularly. Remove from the heat and stir in the soy sauce, sake, rice wine vinegar, and sesame oil, then leave to cool completely. When cool, pour half into a gallon bag, add the fish, and massage the mixture into the fish. Then squeeze out the air, seal and marinate in the fridge overnight. Refrigerate the remaining marinade as well. Just before you cook the fish, with a mandolin, finely slice the radishes and chiles(seed or leave out the chiles if you want to lower the heat factor), and place in a bowl. Trim, finely slice and add the scallions, finely slice the pickled ginger, then add to the bowl with 3 tablespoons of the ginger pickled liquor, the white wine vinegar, and a good pinch of sea salt. Mix everything together. Lastly, chop the cilantro and add to the mix. Preheat the oven to 475 degrees. Put the reserved marinade into a large non-stick ovenproof frying pan and place over high heat on the stove – once it starts to bubble, add the fish, skin side up, and brush all over with the marinade. Transfer to the oven to roast for around 5 minutes, or until beautifully golden and a little crisp on the edges. Serve the fish flesh side up, spooning over leftover juices from the pan. Serve with the radish pickle and a few cilantro leaves. Tags: Blackcod, Cod, Dinner, JamieOliver, JamieOliverComfortFood, Wholey's. Bookmark the permalink. Can’t wait to try this!!! The photo is amazing !! !